Two stars of Virginia’s march to a national championship are moving on to the NBA. 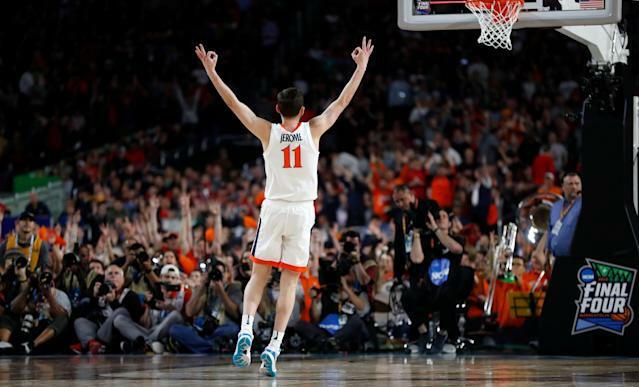 Ty Jerome, who scored in double-figures in all six of the Cavaliers’ NCAA tournament games, announced his decision to forgo his senior season in an Instagram post on Monday morning. “I have had a ball in my hand basically since the day I was born. My dream has always been to play in the NBA. Therefore, after speaking with my family and coaches and giving it a lot of thought, I know it’s the right time to announce that I will be entering the NBA draft and signing with an agent,” Jerome wrote. Jerome, a 6-foot-5 guard who can play both on and off the ball, averaged 13.6 points, 5.5 assists and 4.2 rebounds per game while shooting 39.9 percent from long distance. Jerome closed out the NCAA tournament with three excellent performances: 24 points, seven assists and five rebounds in the Elite Eight win over Purdue, 21 points, nine rebounds and six assists in the Final Four win over Auburn, and 16 points, eight assists and six rebounds in the national championship triumph over Texas Tech. Later Monday, De’Andre Hunter followed Jerome’s lead and also announced his intent to go pro. Hunter, a redshirt sophomore, averaged 15.2 points and 5.1 rebounds per game while shooting 43.8 percent from long range. Hunter exploded for 27 points in the national title game, including hitting the clutch 3-pointer to send the game for overtime. Hunter was 4-of-5 from deep in the win and also added nine rebounds. Jerome’s all-around game was put on display to a national audience throughout the tournament. Jerome was recruited as a point guard but often played off the ball with Kihei Clark and Kyle Guy also starting in the backcourt. Even if Clark or Guy brought the ball up, it was often Jerome initiating the offense and making decisions in crunch time for the Cavaliers. Jerome can guard multiple positions, shoots well from distance and does so consistently, hitting on 39.2 percent of the 424 3-point shots he attempted over his three years in college. He’s not the quickest player but has a tight handle and the craftiness to get into the lane and make contested mid-range jumpers over smaller guards. And if he can’t create offense on his own, he makes the right read and finds the open man. It was Jerome who located a wide-open De’Andre Hunter in the corner to send the national championship game to overtime. Most NBA mock drafts have Jerome being selected late in the first round. Hunter, a native of Philadelphia, took a redshirt his first season before establishing himself as one of Virginia’s best players. As a redshirt freshman, Hunter averaged 9.2 points and 3.5 rebounds per game while shooting 38.2 percent from distance as one of the first players off of Tony Bennett’s bench. He moved into the starting lineup this year and his numbers jumped, 15.2 points, 5.1 rebounds and 43.8 percent from long range. While the 6-foot-7, 225-pound Hunter is a big-time threat as an outside shooter, he also has the potential to be more of an all-around scorer than just a prototypical “3-and-D” prospect. As he showed in the NCAA tournament, Hunter can be a matchup problem for whoever is guarding him. Hunter has a good enough handle to drive past bigger defenders. He can also post up smaller guards when the opportunity presents itself. Hunter works around the rim with ease and finishes through contact at a high rate. Hunter can also defend multiple positions, making him a likely lottery pick. Guy, a junior who led the team in scoring at 15.4 points per game, is more of a question mark. Many drafts have him pegged as a second round pick should he choose to leave Virginia. Guy is a career 42.5 percent 3-point shooter on 597 attempts with the ability to shoot coming off screens or off the dribble. But at just 6-foot-2 and 175 pounds, will he be able to guard at the NBA level? If he decides to enter the draft while maintaining his eligibility, Guy will be able to put some of those questions to the test in front of NBA decision-makers. Update: Tuesday, April 16 - Kyle Guy has declared for the draft but has left the option open to return to Virginia for his senior season.